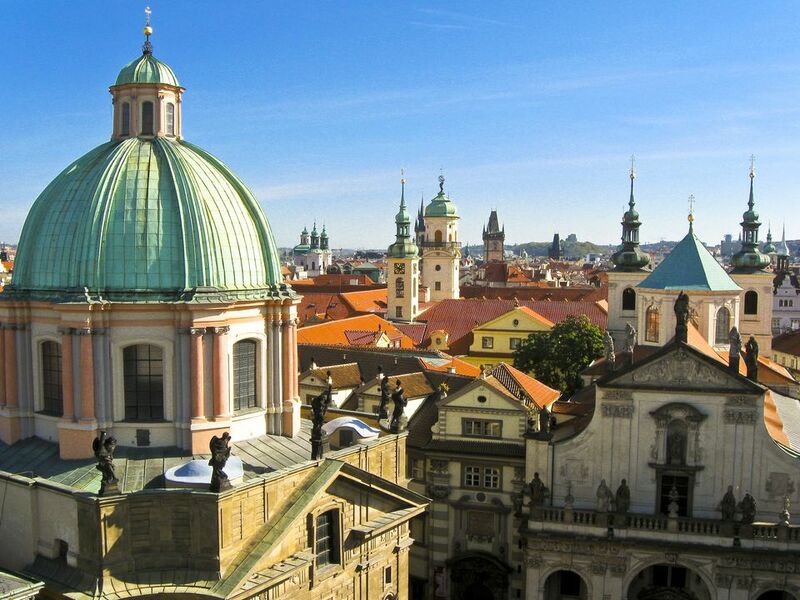 Prague makes for a wonderful Eastern European destination, no matter what time of year you plan your trip. In fact, Fodor's Travel calls it one of Europe's best-preserved cities, with beautiful bridges, tons of interesting architecture, and an old town complete with cobblestone streets. However, if your travel requirements include mild weather combined with smaller than average crowds, April is a prime choice for a trip to Prague. The month starts out on the chilly side, with average highs in the low 50 degrees Fahrenheit range, but temperatures steadily increase throughout the month by about 10 degrees overall. It also gets sunnier as the month progresses, growing from eight and a half hours of daylight to nearly 10 hours by the first of May. At night, the city stays on the chilly side with temperatures falling into the mid-30s to low 40s. Although it's unlikely, you may still see snow this time of year, especially at the beginning of the month. However, precipitation is expected on about 16 days in April, with about half falling as moderate rain and a quarter falling during a thunderstorm or as a light shower. As with any European destination in the spring, when the days are mostly mild and the nights chilly to downright cold, you need to bring a suitcase full of pieces you can layer for varying weather. To save room in your luggage, you can stick with a neutral color palette where a few pieces can make several outfits of varying warmth. Your packing list should ideally include jeans or other cotton pants, shirts, lightweight pullover sweaters or sweater vests, cardigans, and a lightweight jacket. You can also take a long scarf that you can wrap around your neck, which is a great layering trick that really keeps you warm if you need it. Unless you have plans for a dress-up evening, you'll only need to bring flat shoes or ankle boots that are good for walking. Additionally, it never hurts to have a folding umbrella and a raincoat as you'll likely run into a shower or two if you stay for over a week. Although it isn't always observed in April, Easter brings some of the biggest celebrations of the year to Prague; if you're there during Easter, you'll be able to visit unique markets, buy Czech Easter eggs, and attend a variety of religious ceremonies and events. However, if Easter doesn't happen in April, you can always stick around for Witches' Night, which is observed every year on April 30. Additionally, a number of annual festivals and events take place to celebrate the coming of spring and warm weather to the city. Spectaculare: A two-month long celebration of art, music, performance, and international communities of artists from February to early April each year. Workshops, exhibitions, and performances will take place throughout the festival at various venues across Prague. Street Food Festival: The Cross Club in Prague hosts over 10,000 people for a celebration of street foods from around the world. The event happens twice a year—in spring and autumn. Easter: Celebrations in Prague take place most of the month. The markets in Old Town are among the most popular for buying hand-carved wooden toys and Czech Easter eggs. Witches' Night: Also known as Pálení čarodějnic, it started as an outdoor witch-burning event but has now become sort of like Halloween for the Czech Republic. On April 30 each year, the Czechs follow their Slavic ancestors in welcoming spring with bonfires, booze, and costumes in Petřín Hill. April is considered a slow season for international travelers, but it's also one of the best times to visit the city to beat the summer crowds. Planning your trip in April allows you to get dinner and hotel reservations easier, and you won't have to wait in much shorter lines at most attractions. However, on years when Prague observes Easter in April, its huge celebrations draw many visitors to the city, which not only increases the crowds and difficulty of booking reservations, it also increases the prices for airfare and accommodations in the city. Due to the rising temperatures, outdoor and patio dining typically starts to open up at restaurants in April, allowing visitors to enjoy the bustling streets of Prague in spring. Attractions that were closed for the winter will also be opening up this month, meaning you'll have the first round of access to curated gardens, parks, and other outdoor spaces in the city. Although the weather gets warmer throughout the month, nighttime temperatures and the daytime windchill factor on breezy days can still make it feel quite chilly; you should bring an extra sweater or light jacket when you leave your hotel if you're prone to getting cold. What's the Weather Like in Prague in July?